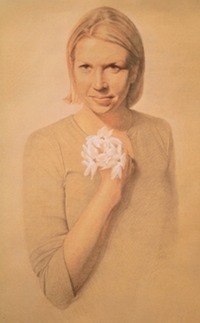 © 2012 Aron Hart, Chandler with Jasmine, 3-Color Chalk on Toned Paper, 19 x 30 inches. 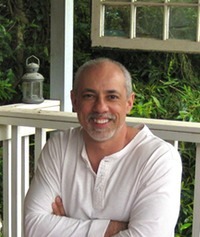 *All classes are taught by Aron Hart in Seattle through the Gage Academy of Art. Working from portrait models, students will study the essential techniques and concepts of proportion, line, value, volume, structure and composition. Focus on the basic concepts of drawing applied to the human form and learn to think visually, translating what you see into a compelling portrait using simple techniques. Discover the essentials of oil painting, from color mixing to paint handling. Students will learn how crop and frame their subject to make a strong composition, use value to structure their imagery and paint with both limited and full palettes. 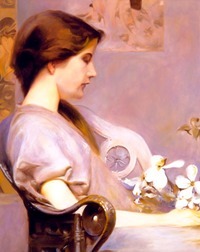 Study the works of historical and contemporary artists and learn the direct method for creating a still-life painting.